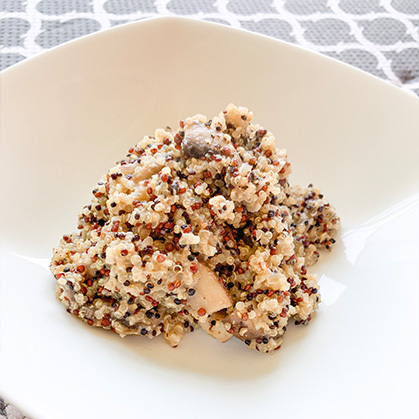 This recipe really masks the “quinoa flavor” if you are not used to the taste or if you don’t care too much for it. I tried using coconut aminos for the first time and I have to say it really added to that “umami” without the MSG and soy! Rinse quinoa & strain through a fine sieve (if you skip this step, there will be a bitter flavor from the saponins on the quinoa). Set aside. Heat olive oil on low/medium heat. Add onions & saute until light brown, covered. Stir occasionally. Add mushrooms, cook on low heat, covered for 3-4 min. Add coconut aminos & cook on low for 2 mins. Cover & bring to a boil on low/med heat. Once boiling, uncover partially & continue cooking on low/med heat. While quinoa is cooking, prepare almond meal paste. For paste, add ½ cup fine almond meal to ¼ cup hot water & mix into a paste. Add the paste to the quinoa & stir. Cover completely & cook on low simmer until quinoa is starting to appear dry. Add crushed black pepper at the end.